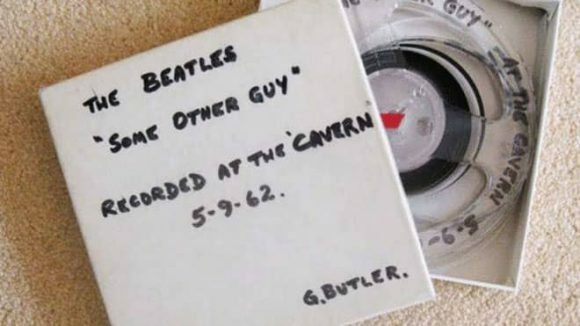 A recording of The Beatles performing at Liverpool's Cavern Club in 1962 has been found after 50 years in a desk drawer. The tape features the group performing Some Other Guy on 5 September 1962. It was recorded after The Beatles were filmed by a crew from Granada TV's Know The North, on 22 August 1962. The sound quality from the footage was deemed to be of poor quality, so sound technician Gordon Butler was sent back to the venue to make a better-quality recording to be dubbed over the film. Butler used three microphones rather than one. He made an hour-long recording of The Beatles, of which performances of Some Other Guy and Kansas City/Hey-Hey-Hey-Hey! have survived. An audio fragment of Kansas City appeared in the Anthology series, although was partially obscured by interview speech. Butler made five acetate discs of the two songs, one of which was sold at Christie's auction house in August 1993. It was bought for £16,000 by Apple Records, the company set up by The Beatles in 1968. The sound engineer ran me off an acetate of Some Other Guy and Kansas City, and he gave another to Ray McFall and a couple to Brian Epstein. I kept mine in my box of records and I should have been more careful. When The Beatles became famous, the record disappeared. In 1993, a copy turned up at Christie's and was sold for £15,000. I don't know if it was my copy and anyway, I couldn't prove it if it was. Epstein also had a small number of acetates made of one of the Some Other Guy recordings, which he distributed through his NEMS store. The reel-to-reel tape was discovered in a desk drawer by TV producer Johnny Hamp, who will auction it for charity on 4 November in Liverpool. It will be sold by auctioneer Adam Partridge. Doesn’t compute. Gordon Butler makes a 1-hour recording, but the tape that turns up in the drawer is just one song? What happened to the rest of the set? Did someone edit the tape down to just one song? Why would anyone bother? I am amazed at the fact that such a thing would be “discovered” in a desk drawer. Why have they -the people involved in the filming and later sound recording- not turned their premises upside down before, trying to find material from that first job with The Beatles? Fifty years to check a drawer? A one-hour recording could well exist, and the closest I know of is a tape purchased by McCartney at a Sotheby´s auction. Supposedly recorded in July 1962, it may very well have been in August or September. I don´t know how precise that date is. The TV songs are not on it so perhaps they were edited out and the remaining part of the set is what Paul bought? Let´s just hope they check their attics, garages, dustbins and kitchen cupboards before we are all gone. ““Despite the argument over authenticity, I found it interesting this tape shows George Harrison to great effect in performance. I also note, Pete Best appears, at least to my eyes, as being a bit tight or restrained in his drumming. I also note his hair remains in the greaser locks of the old days, whereas, check out those outrageously long haircuts of the other three. Since this was made in September of 1962, that should be Ringo on the drums, not Pete. Pete was replaced by Ringo in August of 1962.